ComFlor® 80 is a new generation of steel composite decking that offers longer spans, minimized concrete volumes, and sets new benchmarks for shallow slab construction efficiencies. The efficiency and spanning capacity of the trapezoidal profile is enhanced by the large curved corner and the use of high strength G500 galvanised steel to give major performance advantages. ComFlor® 80 has a wide range of applications, is fast to construct, lightweight, and provides a safe working platform so that the building process can continue without delay. Unpropped spans of up to 5.2m. Design software is available to give unpropped double span options of up to 5.2m. Longer deck spans broaden beam spacing and reduce the number of the support beams, resulting in rapid erection and savings on the cost of the supporting steelwork. Reduced slab depth and concrete usage. 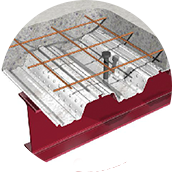 The slab depth required for fire and structural design is minimised by the profile design. Concrete usage is further reduced by the profile shape, which eliminates an effective 44mm from the slab depth. 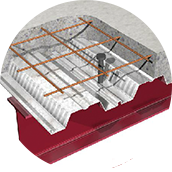 Reduced slab depth and concrete volumes results in lower overall floor height, reduced dead loads on the structure and foundations, and savings on the total cost of the building structure. 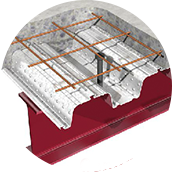 Fire properties of the ComFlor® 80 profile. 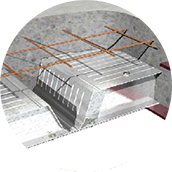 Tests have confirmed the top re-entrant dovetail has no effect on the transmission of heat energy through the slab. 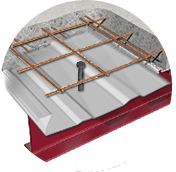 The effective profile height of 80mm results in a reduced overall slab depth being required for any particular fire rating. Fire ratings of 3 hours are possible with ComFlor® 80. Central stud placement ensures correct stud location. The centralised stud position ensures optimum capacity of the shear connectors, enhancing composite action, while reducing the need for site checking of stud location. The result is saving on beam weights and reduced construction risk. Standard shear studs are effective with ComFlor® 80. The Steel Construction Institute confirmed in Note AD147 that the shear connectors should extend at least 35mm above the top of the main trapezoidal section. The ComFlor® 80 profile depth is 95mm including the top re-entrant section and the trapezoidal height is 80mm meaning that a standard 125mm stud is suitable for use with the ComFlor® 80 profile. Comdek Software is available for the design of slabs with up to 3-hour fire rating to BS 5950 or Eurocodes. The profile has been rigorously tested at Imperial College, London. The Comdek program has been independently produced and verified by the Steel Construction Institute in the United Kingdom. Available in 0.75, 0.9, 1.0 and 1.2mm profile gauges.